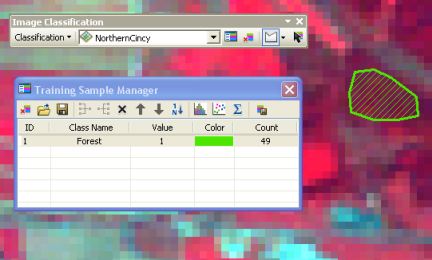 To create training samples, use the training sample drawing tools on the Image Classification toolbar. On the toolbar, choose an appropriate image layer in the Layer list. Click the draw button. Notice that there is a choice of four drawing tools available: polygons, circles, rectangles, and select segment. For the Select Segment drawing option to be available, the image layer in the Layer list must be a segmented raster layer. 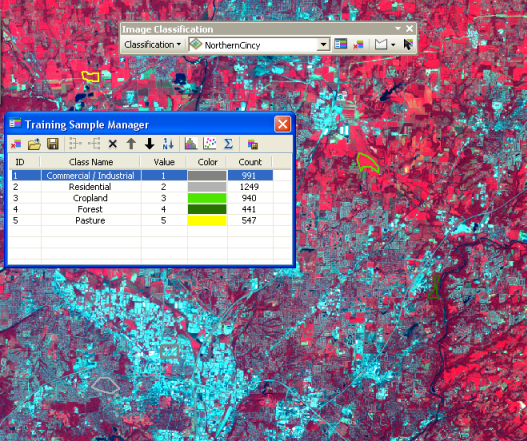 In the map display, identify an area that belongs to a known class. Use the drawing tool to define a training sample. When choosing polygon segments in Select Segment mode, one mouse click highlights the segment and a second click captures the segment as a training polygon. Since a segment is a single object with average attribute values, a statistically significant number of segments (about 15-20) need to be collected to represent a class. Once you finish drawing or selecting the training sample, a new class is created in Training Sample Manager with a default name, value, and color. In the manager, optionally change the class name, value, and color for the class. Repeat steps 2 through 4 to create a few more training samples to represent the rest of the classes in the image.